Parnelli Jones, Steve Saleen and Mustangs, now there’s a recipe for success. Saleen is known for his customized high-performance Mustangs, while Parnelli is known for his success racing pony cars in the late 1960s and early 1970s. The fact that Ford’s venerable muscle car has been restyled beautifully in the last 5 years makes it perfect timing for the three forces to come together, both in the real automotive and die-cast car worlds. Autoart has been cranking out near perfect versions of the Mustang now for several years and its new 1:18 version of the 2007 Saleen Mustang Parnelli Jones edition is yet another winner. Parnelli is the 1963 Indy 500 winner who also excelled at virtually all kinds of racing, from Baja buggies to stock cars. But in 1970 he ran an orange No. 15 Boss 302 Mustang in the SCCA Trans-Am series and won in convincing fashion over some top shoes. This car, designed and executed by Saleen in his California shop, recreates that look, but with the 2007 Mustang as its base. The car had a 302 V8 that created 370 horsepower and rode on chunky 19-inch tires mounted to Minilite-inspired alloy wheels. 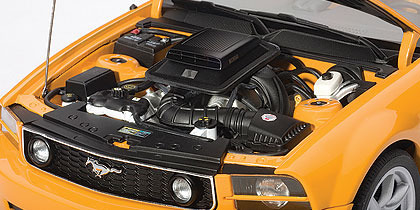 (Ford now offers a real 2012 Boss Mustang with a 302! … you can see my Savage On Wheels video of it on You Tube) There was the usual assortment of Saleen-inspired performance parts, like forged-aluminum pistons and forged-steel connecting rods and crankshaft, plus a Watts Linkage on the live rear axle, Tremac 5-speed manual gearbox and 14-inch vented disc brakes. Only 500 were built and they cost $61,565 each. Performance: Autoart’s model recreates the look to a T, and the cost is considerably less. 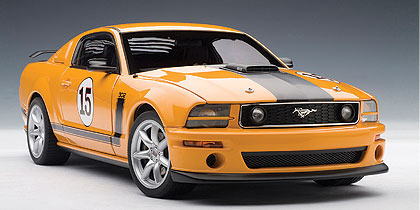 First, the car is bathed in Grabber Orange paint, like the original Jones racer, and the Saleen remake adds a black hood and side stripes with the 302 label. 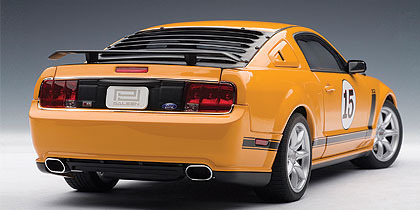 There’s no Boss marking though as that brand name is owned by Ford and Saleen did not have permission to use it. Now that Ford has re-introduced the Boss, the reasons are clear why they didn’t license it to Saleen. Other outward signs this is something special include Parnelli Jones’ name painted above the driver’s door, a No. 15 in a white circle on both doors and the hood, louvered black rear window cover and rear spoiler, a Shaker hood and air scoop, racing-style billet gas cap, trunk insert license with PJ and Saleen inscribed on it, alloy-look wheels with PJ center caps, a racy front fascia and my favorite, a stylish orange bar across each headlight. Aside from the detailed body markings and finish, Autoart delivers a nicely detailed V8 with air and coolant hoses, fluid-fill caps that are marked and a good looking battery with electrical hookups. The trunk opens too, but there’s just a gray liner. Inside, the model has better detail than many models in this price range. The chrome-ringed gauges look great and there are twin racing-style gauges atop the dash. The shifter looks realistic too, along with the center stack controls. Seats are black and orange, like in the real car, and most impressive are miniature PJ and Saleen signatures mid-dash, again as in the original. Overall: This is a beautiful model at a reasonable cost for the detail you get. Plus it’s a Mustang, so what’s not to like? Ride along with me in the 2012 Boss 302 Mustang at Road America.